As part of our membership of Live Art UK, we are proud that Lancaster Arts is a delivery partner on the national Ambition for Excellence project Diverse Actions. This three-year initiative champions culturally diverse ambition, excellence and talent in Live Art. Through Diverse Actions, we are offering an artist a £3,000 commission and package of support to realise a new piece. We are delighted to announce that the recipient of this commission on the theme of ‘This Place’ is Fabiola Santana. 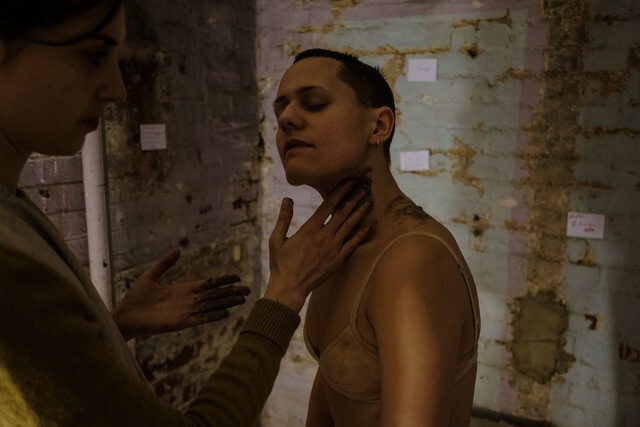 We are thrilled that we will be supporting Fabiola to develop her new piece A Home for Grief which is part of her body of work called Houses of Decay. It will be presented in Lancaster in April/May 2019. Fabiola has been slowly creating Houses of Decay over the last four years, through research and workshops. Some research has been translated into early performance explorations. The workshops have been delivered for artists and non-artists at the Guest Projects' Your Reality is Broken, and as part of Dying Matters awareness week 2017. Fabiola and participants used movement to create a cyclical interaction on care giving and replenishment. She also ran a DIY workshop series at LAB in Leeds. This workshop series reclaimed the role of women as a conduit for communal mourning, and placed rituals into public spaces. The participants connected with passers-by: washed their hands, asked what their parents taught them about death; held a silent wake; and offered bespoke laments. Part of Fabiola’s research has included training with Namaste Care, which is a programme designed to improve the quality of life for people with dementia – in their own homes and wards – where she has learned hand massages, creative interactions, and ways in which the carers and family can connect to their loved one at their end of life. Fabiola will begin work on the commission this autumn and will be in residency at Lancaster Arts in spring 2019. If you are interested in the progress of her project, keep a look out for further updates and announcements of opportunities to engage with her. For more information about Fabiola Santana and her practice, please visit her website. Alice Booth, Creative Producer says: “Grief and death affect us all, yet in the UK we tend to alienate the bereaved, treating grief as a private affair, or we are even embarrassed by it. I’m drawn to the gentle and warm ways that Fabiola is proposing to embrace and ritualise grief through a deep connection to Lancaster and its people… I think this is an exciting project and builds on some of Lancaster Arts’ earlier projects dealing with death and mourning”. Fabiola says: “This is my first solo work, I am highly appreciative of the work that Lancaster Arts does and supports, and I am looking for possibilities to create new relationships to support my own practice, in my new home in the North West. This commission is a unique opportunity to help me understand how to integrate my work into the needs of relevant communities”.